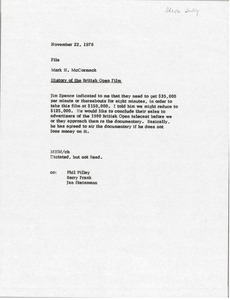 Notes on the History of the British Open film. 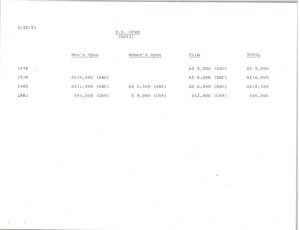 Jim Spence notes a cost per minute needed and McCormack suggests a lower overall figure. 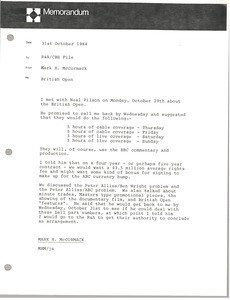 In addition, Spence would like to conclude negotiations for the 1980 British Open telecast prior to approaching with the film. 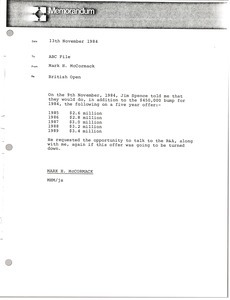 McCormack files a memorandum regarding the British Open in the ABC file. He provides information regarding a five-year offer that Jim Spence told him they would do. McCormack notes that Spence requested the opportunity to talk to the Royal and Ancient and McCormack again if the offer was going to be turned down. 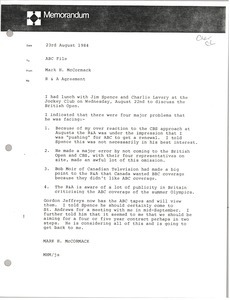 McCormack notes his talk with Neal Pilson of Columbia Broadcasting System. Pilson quoted the price he is willing to pay for the British Open. 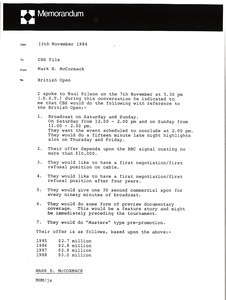 McCormack notes his meeting with Jim Spence and Charlie Lavery regarding The Royal and Ancient Golf Club of St. Andrews and British Open agreement. 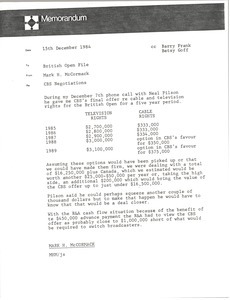 Concerning CBS negotiations with the R & A for television and cable rights to the British Open. 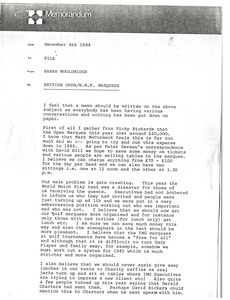 Notes on the British Open and World Match Play marquees, specifically to do with problems that arose in 1984 with costs, undesirable guests and other issues which should be rectified in 1985. 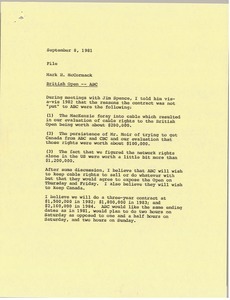 McCormack writes notes on the British Open and American Broadcasting Company. 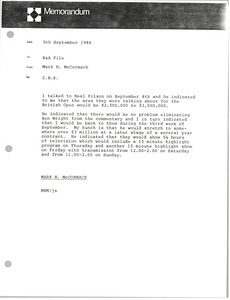 McCormack records notes on the things Neal Pilson has informed him that CBS would do with reference to the British Open.